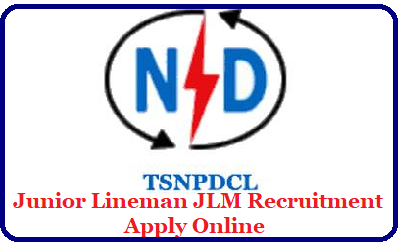 2553 Junior Lineman (JLM) Posts: Telangana State Northern Power Distribution Company Limited (TSNPDCL) issued TSNPDCL JLM Recruitment 2018 Notification for the recruitment of 2553 Junior Lineman (JLM) posts for Telangana State Northern Power Distribution Company Limited (TSNPDCL). Eligible candidates can apply online through tsnpdcl.cgg.gov.in from 22.02.2018 to 19.03.2018. 2 years Intermediate Vocational course in Electrical Trade only from a recognized Institution/ Board of combined A.P/ Telangana State Education Department as on the date of notification. Minimum 18 years and maximum 35 years. Relaxation in upper age limit is permissible up to 5 years for SC/ ST/ BC candidates. Eligible candidates can apply online through tsnpdcl.cgg.gov.in from 22.02.2018 to 19.03.2018. Each applicant must pay Rs.100/- towards Online Application Processing Fee. This apart, the applicants have to pay Rs.120/- towards Examination Fee. However, the Applicants belonging to SC/ ST/ BC Communities and PH are exempted from payment of examination fee. Selection will be made through Written Test and Weightage Marks (20 marks maximum) for in-service. The written test comprising of 80 marks consisting of 80 multiple choice questions and each question carries 1 mark. The section A consisting of 65 questions on core I.T.I subject and the section B consisting of 15 questions on General Awareness and Numerical Ability. The duration of the written examination will be of 2 hours.